I went skiing over the winter break and since I don’t do it very often or very well, every day on the slopes took a lot of effort. I could feel my body mobilizing its resources before every run: my heart rate would go up, I could feel increased circulation to my limbs, my breathing would become faster—all of the signs that you would associate with stress response, or sympathetic (fight-or-flight) nervous system activation. Yet I wasn’t particularly stressed, just ready to move. This type of response would give me a surge of energy to make my way down the mountain. Then as I rode up to the top of the mountain on the chair lift I could relax, enjoy the stunning views and soak in the quiet majesty of the mountain. I think this example perfectly represents the actions of our autonomic nervous system. When you prepare to be active you need to mobilize your resources. 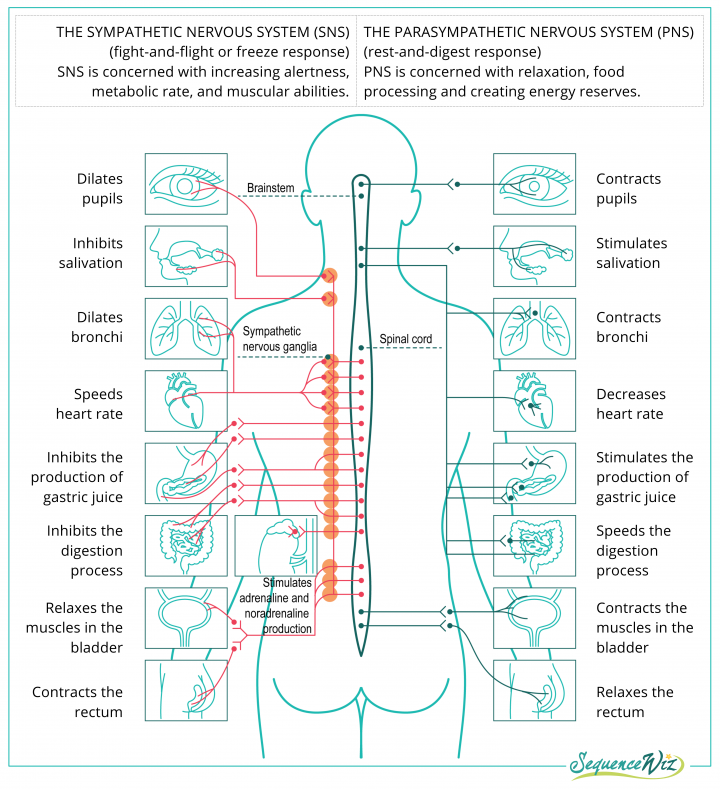 So your body speeds up your heart rate, dilates your blood vessels, and dumps cortisol into your bloodstream to give you an energetic boost (sympathetic activation, fight-or-flight mode). This is like pressing a gas pedal in your car. When you need to slow down, you “put your foot on the brake,” shifting into parasympathetic (rest-and-digest) mode, which slows your breathing, decreases your heart rate, reverts the blood flow from exercising muscles to your digestion, and so on. As you drive your vehicle of a body throughout the day your foot is always either pressing on the gas pedal or applying the break, experiencing some of the related physiological shifts outlined in the diagram above. All those physiological shifts either deplete your energy or regenerate it. We can think of it in terms of your physiological “body budget.” Everything you do in your daily life acts either as a deposit toward the body budget or as a withdrawal. When your brain anticipates something physically challenging, it makes a withdrawal from the body budget to enable you to rise up to the challenge, like it did every time I was about to ski. But I could get the same physiological reaction if I just anticipated skiing without doing any actual movement. It’s long been known that anticipating a stressful event makes you feel stressed and anticipating an upcoming fun trip makes you happy. Now science confirms that simply thinking about any object, event or scene changes your physiological state and can either drain your energy or replenish it. “Based on these and hundreds of other studies, we now have good evidence that your brain predicts your body’s responses by drawing on prior experiences with similar situations and objects, even when you’re not physically active.”(1) For example, if you know how a specific yoga practice makes you feel, just going through it mentally without any physical movement will have a similar physiological experience in your body. In addition, other people impact your body budget as well. “When you interact with your friends, parents, children, lovers, teammates, therapist, or other close companions, you and they synchronize breathing, heartbeats, and other physical signals, leading to tangible benefits. Holding hands with loved ones, or even keeping their photo on your desk at work, reduces activation in your body-budgeting regions and makes you less bothered by pain. This is important to recognize because your physiology both dictates the way you feel from moment to moment, and also because negative balances and surpluses in your body budget can lead to disease. Are you aware of those physiological fluctuations in your daily life? Do you have enough energetic deposits to balance out the withdrawals? 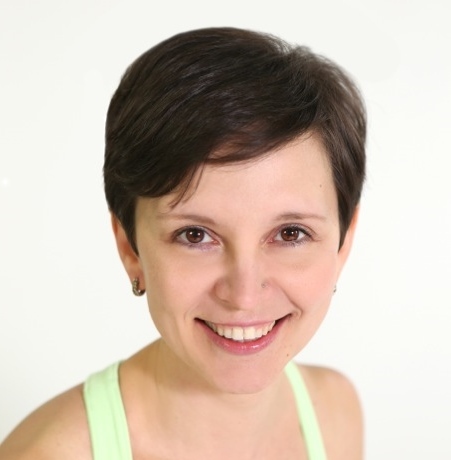 Insightful yoga practice tips in a course by Olga Kabel and YogaUOnline - Yoga for Every Body: How to Adapt Yoga Poses for Different Situations, Conditions, and Purposes.